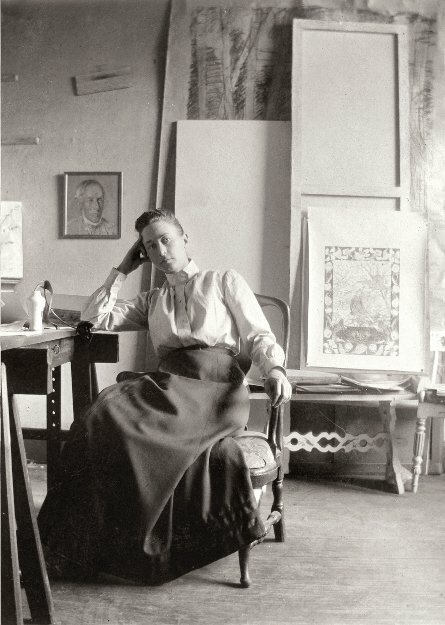 Several years before the world was welcoming the gigantic proponents of modernism, such as Wassily Kandinsky, Kazmir Malevich, and Piet Mondrian into the mainstream, af Klint was quietly creating her dazzlingly bold and colorful swirls, her biomorphic shapes and rectilinear constructions. The pull of the outside world had little interest for her. So little, in fact, that she stipulated that no one would see her creations until 20 years after her passing. The shocking fact is that 40 decades passed before her inclusion in “The Spiritual in Art: Abstract Painting 1890-1985” at the Los Angeles County Museum of Art. In 1989, a small selection of her paintings was seen by New Yorkers at PS1 and curated by af Klint advocate R.H. Quaytman. His works, entitled +x. Chapter 34 are placed on the top ramp of the rotunda for this exhibit, as if to put a finishing touch to her own scientific and transcendental imagery. But I’m sure that many visitors would agree that af Klint’s divergence from such curatorial conventions make this addition informational but peripheral at best. As for the overall conception of this landmark exhibition, Tracey Bashkoff, director of collections and senior curator, along with curatorial assistant David Horowitz, have done an outstanding job. The accompanying catalogue, edited by Ms. Bashkoff, with essays by Tessel M. Baudin and Daniel Birnbaum, among others, is a worthy addition to any art or history lover’s bookshelf. 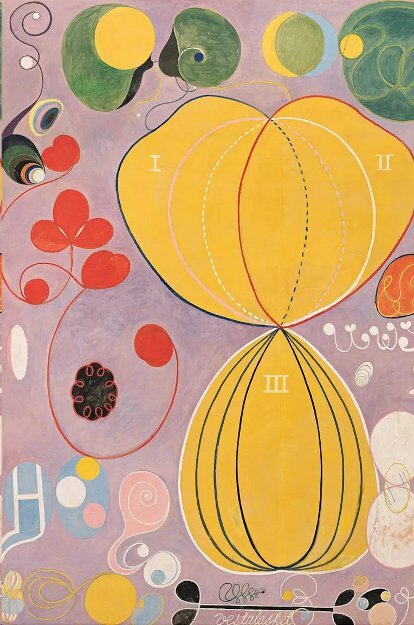 So, where do we begin to explain the phenomenon of af Klint? Born into a prominent seafaring family, her nascent talents were quickly recognized. Following her studies, she was able to procure a studio in the heart of Stockholm’s bustling capitol. It’s easy to see from a beautifully rendered landscape reminiscent of Corot on display that a conventional career lay before her—if she wanted it. Maybe we’ll never know if the death of a younger sister a few years later convinced her to plunge deeper into her spiritual investigations. In her formative years, there was a wealth of ideas afloat in the “ether” if you will. Foremost among these was Madame Blavatsky and her Theosophical Society, which maintained that a knowledge of God is achieved through spiritual ecstasy and direct intuition. For af Klint such explorations, along with her scientific curiosity about electromagnetic waves—the proof of the “unseen”—was a natural fit. In 1896 she joined forces with four other women, calling themselves The Five (De Fem). For the next several years, The Five were in communication with a series of astral beings or High Masters, producing automatic writings and sketchbooks abundant with pulsing circles and spirals, shapes reminiscent of snails and eggs, and at times a secret symbology difficult for the uninitiated to unravel. But it would be wrong to assume that af Klint was simply an empty vessel, merely intent on recording. When High Master Amaliel commissioned a series of paintings to depict the “immortal aspects of man,” af Klint was the only one of the five that embraced the task. She began her solo endeavors in 1906, for what was to be “The Paintings for the Temple.” The organic forms for The Ten Largest were to illustrate the stages of life—childhood, adulthood and old age. These monumental works were produced in tempera on sheets of paper later affixed to stretched canvas. Except for a four-year pause while she was caring for her blind mother, by 1915 she had completed the 193 works that comprised her mission. This also included 10 blue notebooks, along with a glossary of an esoteric vocabulary, and a special index of symbols. If all this immersion into a world beyond sounds a little heady, the work speaks for itself. Her color sensibility is first-rate. Pinks, yellows, greens, and blues bubble up with an effervescent power—carrying the viewer on his or her own evanescent journey. But her range is wide, the progression from representational elements to abstraction almost beyond definition. As one moves up the rotunda, the eye is caught in continual surprise. In The Primordial Chaos, No. 7, part of a series of 26 blue and yellow paintings, a circular shape is seemingly propelled through space, leaving plumes of white smoke in its wake. The blue and yellow palette signifies female and male in her color theory. In The Swan series, the 24 images begin with a merging of two birds with beaks locked in a kiss. Contrasting black and white shapes symbolize the duality in nature and progressing into pure abstraction, a unity of opposites is created. The artist was obviously imbued with an unflappable curiosity. This was due in no small part to the prevailing obsession with evolutionary theories, the discovery of subatomic particles, soundwaves, and other evidence of a material yet invisible world at one’s fingertips. The Atom series from 1920 attests to her own lifelong obsession with what could not be seen with the human eye. For this reviewer, the most bold and arresting series was produced in 1915, where her mastery of geometrical form is on full display. This comprises three large altarpieces, where the eye travels upward and downward and merges in the third image into a giant orb of light. These three were meant to be placed in an inner sanctuary within a spiral-shaped temple. 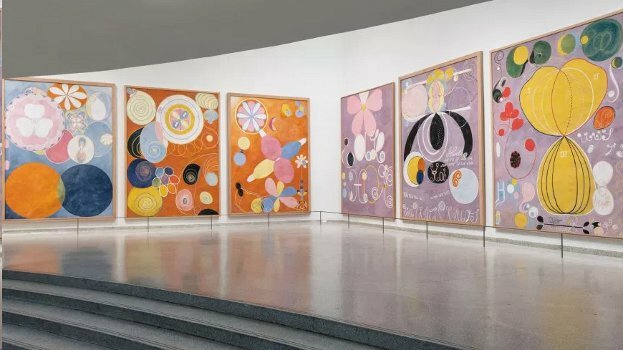 Considering founding patron Hilla Rebay envisioned the Guggenheim as a “temple” to abstraction and Frank Lloyd Wright brilliantly complied, it’s easy to argue that af Klint’s works finally found the perfect home. Sandra Bertrand is Highbrow Magazine’s chief arts critic.